April has been declared "Grange Month" by the National Grange, and Community Granges across Connecticut are taking the opportunity to showcase the organization and its purpose, programs and activities. 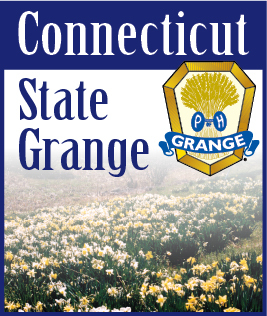 The theme for Grange Month 2011 is "Connecting Communities Through Service" and is reflective of the efforts and accomplishments of Granges in Connecticut as well as nationwide. The Connecticut State Grange, along with the nearly 60 Granges across Connecticut, will be opening doors to their communities throughout the month of April to celebrate. Many of these Granges will celebrate Grange Month with open houses, lectures and programs, citizens' and membership awards, service projects, community displays, traditional pot-luck suppers and more. Connecticut State Grange President Jody Cameron explains the importance of Grange Month to Connecticut Granges. "Grange month is an excellent opportunity for Granges and Grangers to introduce the public to the positive influence and impact it has on the community in which it serves." The Connecticut State Grange, celebrating its 125th Anniversary throughout 2010-2011, will also be hosting a number of events in April, including a Grange Rally on April 3rd, Grange Mystery Night April 30th, "Bowl Across America" Fundraiser on April 9th, Grange Online Chat on April 27th, and a clean-up day at the CT State Grange summer camp, Camp Berger, located in Winchester Center on April 23rd. The Connecticut State Grange is an integral part of rural and non-rural communities across the state, with currently nearly 60 local Grange chapters in Connecticut. Local Granges are committed to bettering their communities through service projects and family orientated activities. Events will be open to the public and those interested are encouraged to attend and participate. National Grange President Ed Luttrell explains the community impact of the Grange. "The Grange has 144 years of experience in serving American communities through legislative efforts, education, and service projects. Grange Month is a wonderful time to share the opportunities that the Grange gives people and communities to come together and accomplish great things." Founded in 1867 to help farmers recover from the ravages of the Civil War, the National Grange is the oldest US rural community-service, family-oriented organization with a special interest in agriculture. Over the years, the Grange has evolved to incorporate the interests of farm and non-farm families in rural, suburban and urban communities. Agricultural and legislative initiatives, rural health care, education and communications access are just a few of the Grange's current areas of involvement. The organization has approximately 240,000 members in nearly 3000 local and state chapters across forty states. For a complete list of Grange Month events in Connecticut, or to locate a Community Grange, please visit the Connecticut State Grange website at http://www.CTStateGrange.org. For more information on Grange Month, please visit the Grange Month information page on the Connecticut State Grange website at http://www.ctstategrange.org/GrangeMonth, or visit the National Grange website at http://www.NationalGrange.org.